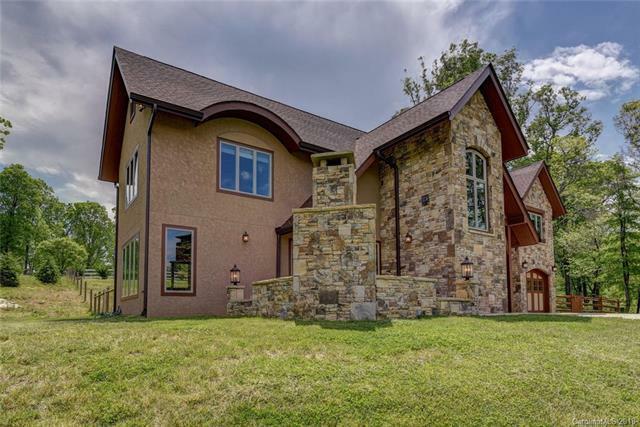 Custom-built stone and hard stucco home on pristine 19.67 acres of rolling pastoral hills with Mountain views. This home offers 4 bedrooms/3 Baths, solid alder doors, tile archways, custom built-ins and spacious great room on the upper level. The Gourmet kitchen has solid surface countertops and stainless steel appliances. Spend nights in front of the outdoor fireplace and entertain on the flagstone patio. The home also features tray ceiling in master suite, vaulted ceiling in guest bedroom, On-demand hot water heater, water softener system, solid wood garage doors and more. Fenced in backyard is great for your pets and children. The perimeter of the property is fenced and has room to build a barn and rotating paddocks so bring your horses. All of this only 20 minutes from downtown Asheville.